What is Jiangtou Village Jiuwu Town? ﻿About 32 kilometers north of Guilin city and a 45-minute car ride from Guilin, Jiangtou Village is one of the seven most ancient villages of China, which still lives its ancient lifestyle in today’s modern era. With a history of over 800 years, this reputed scenic village displays a precious and preserved architecture from the old Ming and Qing Dynasties. ​With an area of about 217 square kilometers, the village has about 158 families with population of 680, which include many minorities such as Yao, Zhuang and Hui as dwellers since the ancient times. A very striking feature is that the family’s name of all the villagers is Zhou from their ancestor, Zhou Dunyi, a famous philosopher of Northern song Dynasty. The village has about 620 ancient buildings. It also has ancient wells, narrow long slate alleyways, stone arch bridges, exquisite, unique and elegant wooden carvings on windows and doors along with gorgeous natural surroundings. It takes you back to the Ming and Qing era. The brick walls obstruct seepage of rain. ​The black tiles record the history of the village while the ornamented beams reflect the profound local culture and ornamental engraving-decorated gates standing for the particular flavor of the architectures. As a secluded Ancient Town, it offers tourists to experience the ancient China. 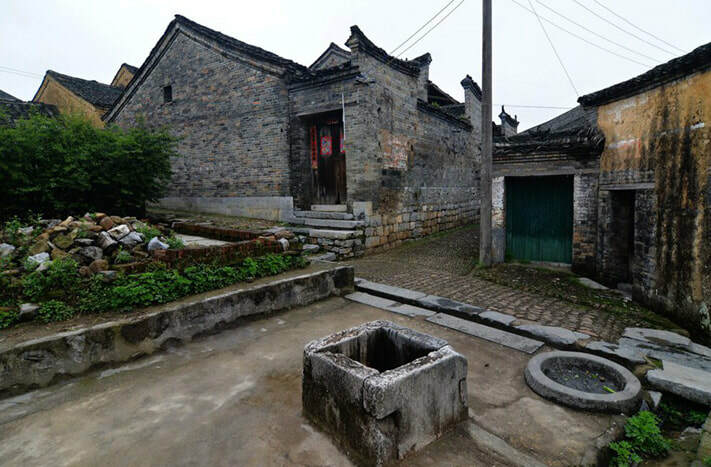 Interested in visiting Jiangtou Village Jiuwu on a Tour? Wendy Wei Tours offers a variety of different packaged tours as well as custom tours including Jiangtou Village Jiuwu, among other attractions and destinations. To find out more, please visit our Tours page or Contact Us directly to find out more.